There is currently a dearth of small, lightweight short to medium telephoto lenses for the Sony E mount 'full frame' cameras. And while some may be introduced in the future, I suspect they will be priced quite high. 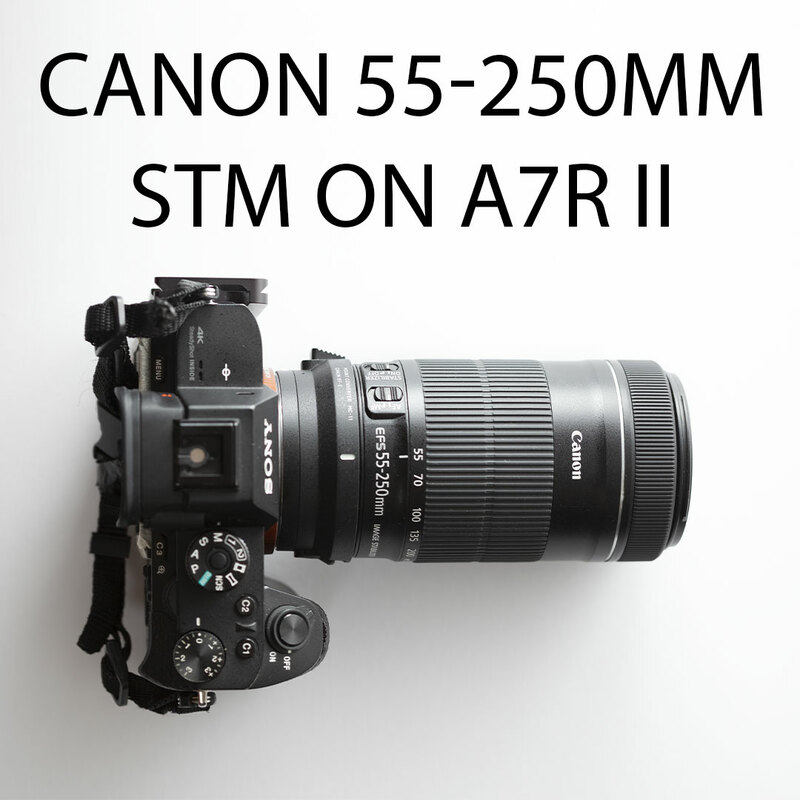 So I thought I'd see how the Canon EF-S 55-250mm f/4-5.6 IS STM lens performs on my A7R II. This is a lens designed for APS-C, but the A7R II has enough megapixels that using an APS-C crop isn't a disaster. 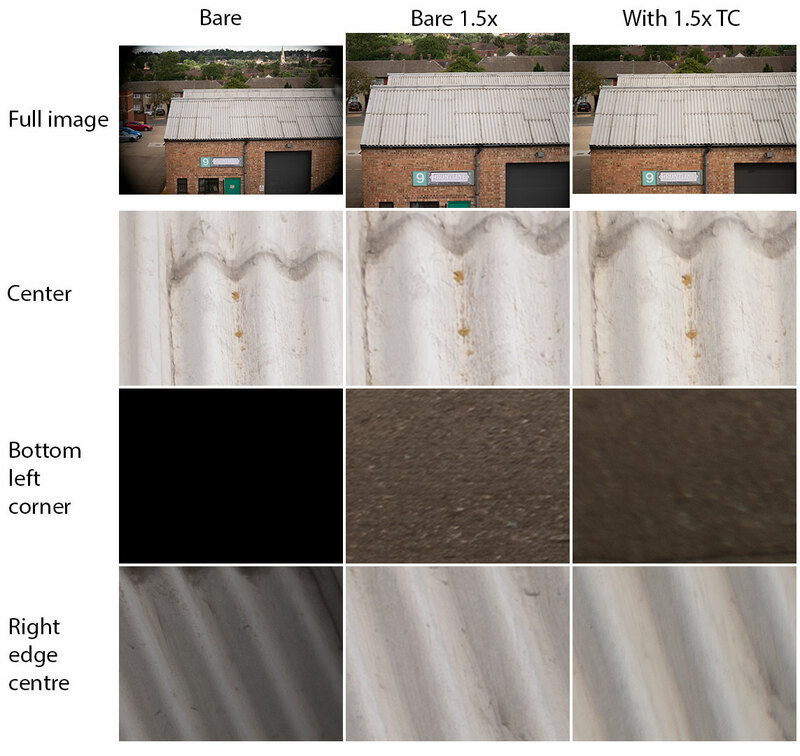 Does it cover a usable imaging area larger than APS-C? How well does it work with a 1.5x teleconverter? I don't shoot at longer focal lengths a lot, so when travelling I don't really want to be carrying a large heavy lens that I won't be using much. The Canon 55-250mm STM lens gets good reviews for it's image quality (on APS-C), it's cheap (around £100 used), small, and light. So it seemed like a good choice for me. As an EF-S mount lens, it won't mount on a Canon EF (full frame) body, nor unfortunately on my Sigma MC-11 adapter for my Sony camera. The EF-S mount protrudes further back into the camera throat than the EF mount. 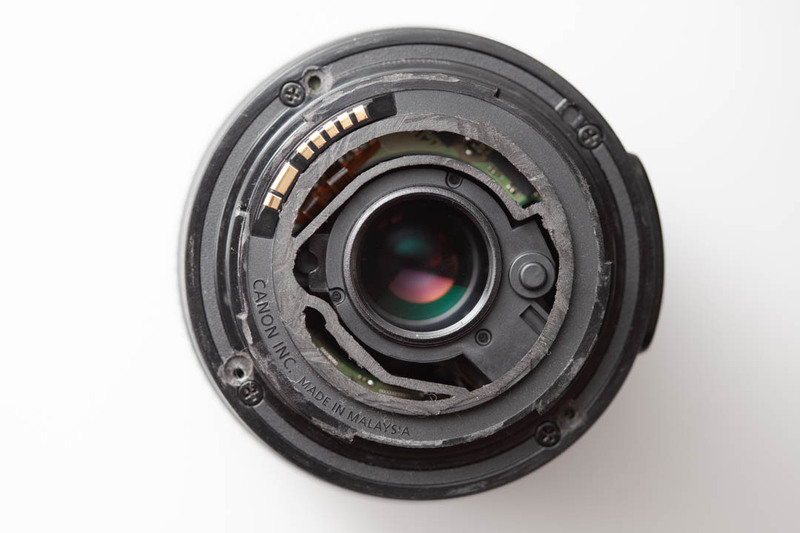 Since the actual optics of the lens do not protrude further back, this problem can be resolved by shaving the excess plastic from the lens mount. I don't think I actually shaved enough of the rear mount off on my copy, as while the lens will mount on my Canon body, the mirror can't fully flip up to use it properly. I think the rear mount would need removing all the way to the innerside of the lens contacts for it to fit a Canon EF mount body properly. However, with the amount that I shaved it will fit on my Sigma MC-11, and so can be mounted on my Sony body, which was my main concern. It would be nicer if the lens could be mounted without having to mangle the mount, and this can be done if using it with an EF-S compatible teleconverter. As far as I'm aware there is only one EF-S TC model in existence - the Kenko Teleplus HD. Unlike most TCs, the Teleplus HD has recessed lens elements rather than protruding. So you can mount EF-S lenses, or non-telephoto EF lenses on it without the TC lens elements fouling against the rear element of the mounted lens. If the TC could make an APS-C lens cover a full frame sensor while retaining decent image quality, then this would be a great purchase. I had already tried this TC with my Canon 8-15mm fisheye where it performed very poorly towards the edges. But it would have been designed for use with telephoto lenses, not fisheyes, so I was hoping for much better performance with the 55-250mm lens. 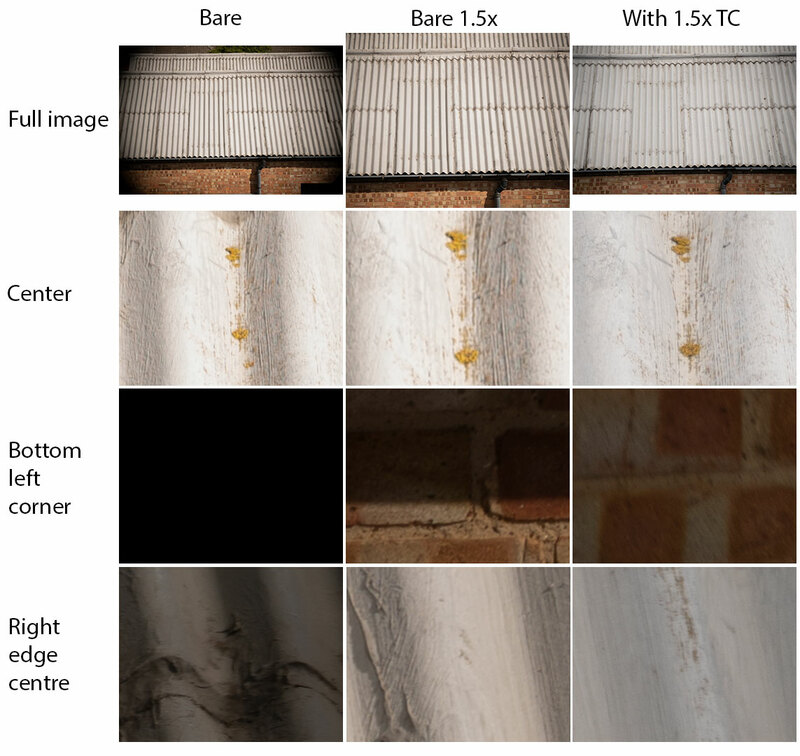 To test the lens, I took photos with the bare lens at the marked focal lengths on the lens' zoom ring, then repeated the test with the TC added. 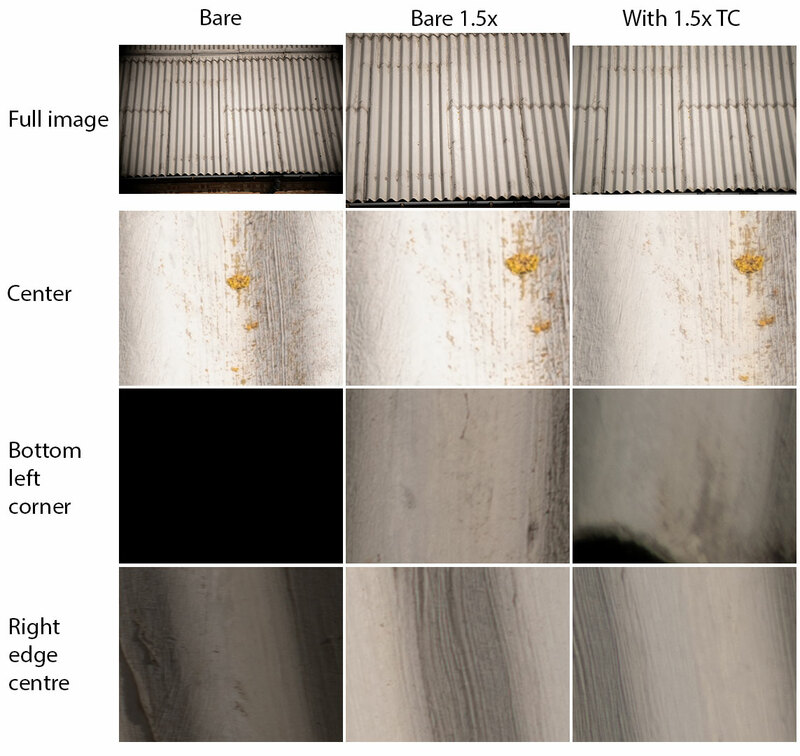 I then compared these images along with the bare lens image magnified by 1.44x to match the magnification of the TC images. 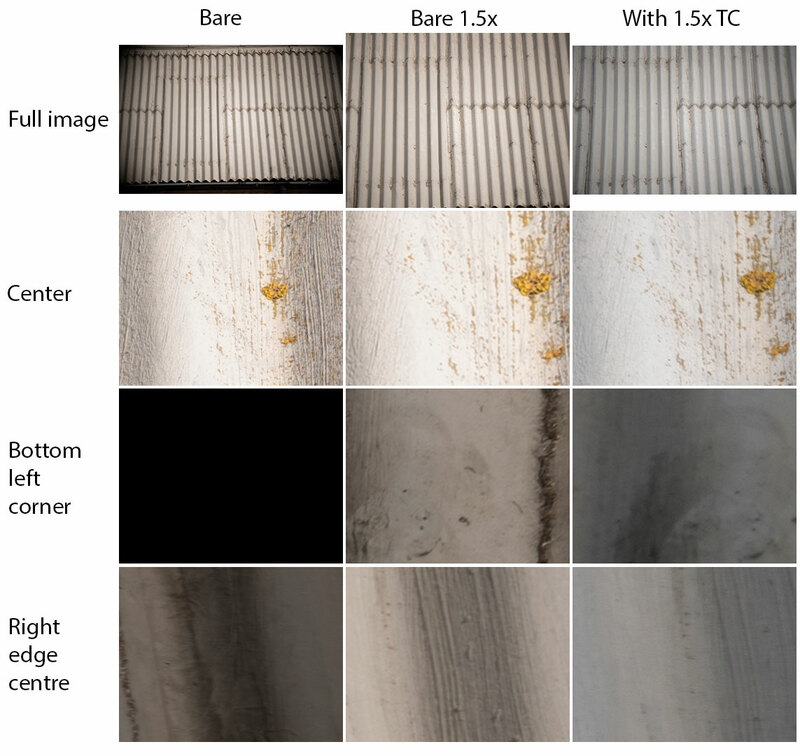 This let me see if the TC was having any positive effect, or if you'd actually get a better result by just shooting without it then enlarging the image in post. With the teleconverter the corners are consideriably softer. 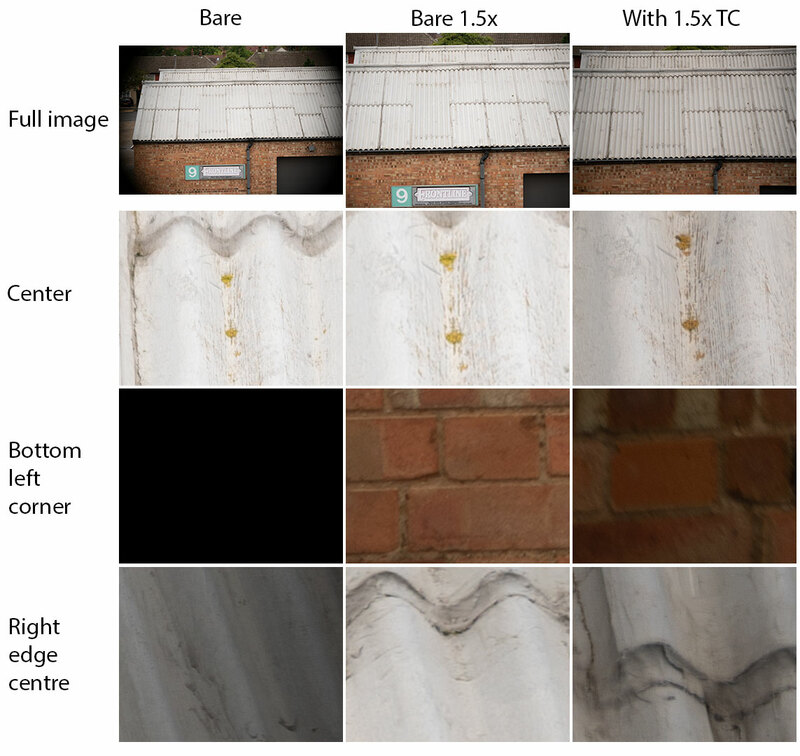 The centre is sharper with TC compared to bare + 1.5x enlargement, but the corners and edges are worse. For me, this means the teleconverter solution for FF coverage is not really suitable. But if you are photographing subjects (such as portraits) where you don't really care about edge sharpness, then this could be a decent combination. 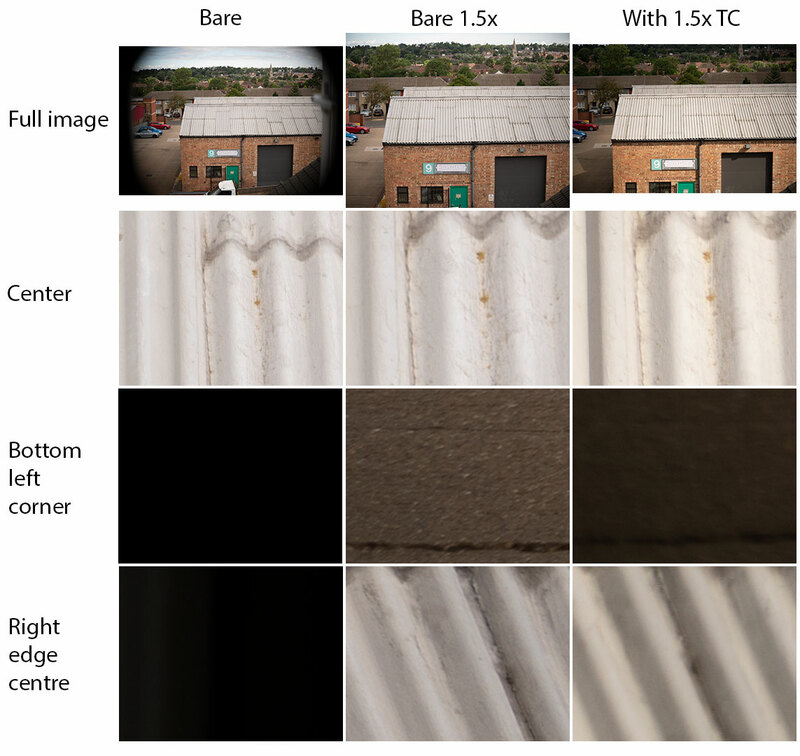 Without the TC the lens definitely doesn't cover FF but does cover larger than APS-C (approx 1.3x / APS-H coverage). However, there is some field curvature (focus is further back towards corners than in center), so it performs best cropped to APS-C. There is no improvement of coverage on zooming, always black corners through the zoom range, which suprised me. AF sometimes has trouble locking when contrast is not high / light levels are not optimal, moreso with the TC and also towards the longer end of the lens (where f-stop is smaller). But please bear in mind this is with the Sigma MC-11 on a Sony A7R II. Other adapters / camera bodies may give different results. IBIS (SteadyShot) is not available with the lens, but as it has IS on the lens, this is not a big issue. As with the AF issues, I suspect this is down to the Sigma MC-11 adapter. I also tried taking a couple of test shots with a 135mm/2.8 @ f/4 and 200mm/4 @ f/4 prime lenses. Both lenses gave sharper results (not much difference in the middle, but sharper at the edges and no vignetting). However, just one of those primes is considerably heavier than the Canon 55-250mm. For me, I think this lens will get a place in my kit bag, possibly with the TC (but only for use where edge sharpness is not important). It gives me telephoto reach (albeit with a loss in resolution) with not much penalty in size and weight, and at a relatively low cost. 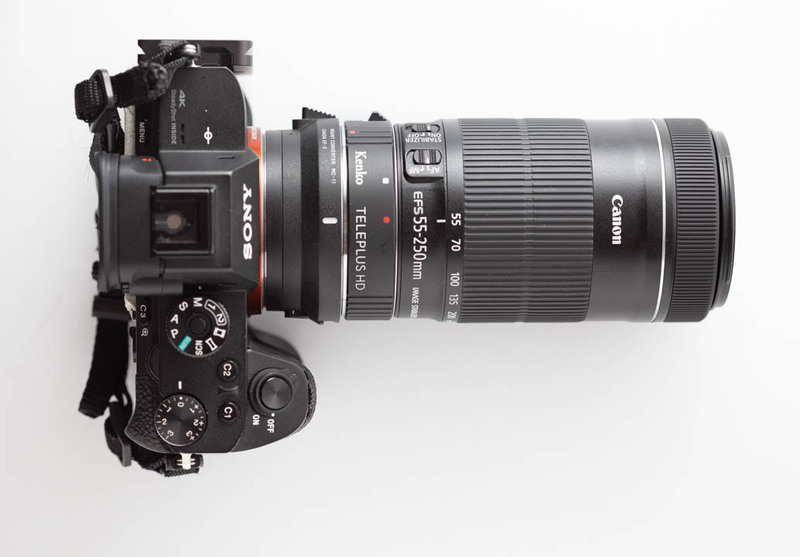 Ideally I'd love a version of this lens that is roughly the same length, but a wider girth (and so increased weight) that covers full frame for, say, twice the cost of the APS-C version. That sounds reasonable to me, but I doubt it will ever happen.